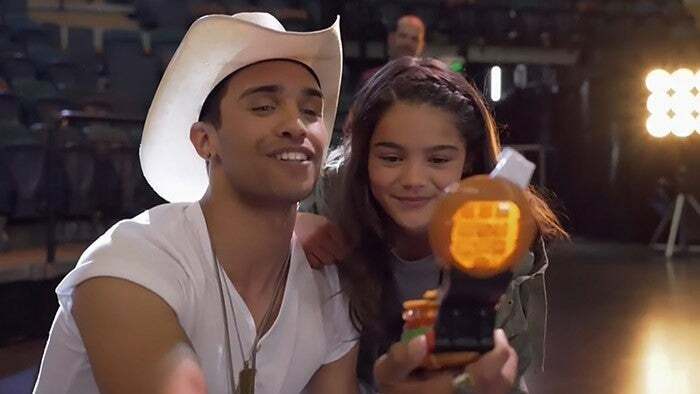 Power Rangers fans are waiting for Super Ninja Steel to return to television, and we've got a new interview with the cast of the show to help you pass the time. Power Rangers Super Ninja Steel features a talented cast of Rangers, which includes William Shewfelt (Brody/Red Ranger), Chrysti Ane (Sarah/Pink Ranger), Nico Greetham (Calvin/Yellow Ranger), Peter Sudarso (Preston/Blue Ranger), Zoe Robins (Hayley/White Ranger), and Jordi Webber (Levi/Gold Ranger), though Zoe couldn't join us this time around. ComicBook.com had the chance to chat with the cast for a bit about the show, dealing with social media, interactions with the fans, and more. It has to be a surreal experience becoming part of this 25-year franchise, but as Nico points out, it's also extremely rewarding too. "I would definitely say one of the best parts about this entire experience has been just the family that we've created amongst each other" Greetham said. "It's just like such a good group to get together and we don't see each other very often aside from work, but when we get together it's just like this magical thing that happens where we just get excited and flustered and we just get crazy. It's just a solid group of humans." "Since Power Rangers, I think the coolest thing for me is realizing how much passion the kids have for us," Sudarso said. "I've had two opportunities to go and visit kids who are sick for the Make-A-Wish and it's so endearing and also mind-blowing to me that these guys would wanna see us for their one Make-A-Wish thing, and making that kind of impact is pretty mind-blowing and it's pretty awesome." For Jordi though, it all crystallized when he saw his action figure for the first time. "They've already said the good stuff so I'm just gonna say something right now," Webber said. "We've spoken about, I'm like, "Yo, it's freaking cool that we have our own toys, eh? That's pretty dope." 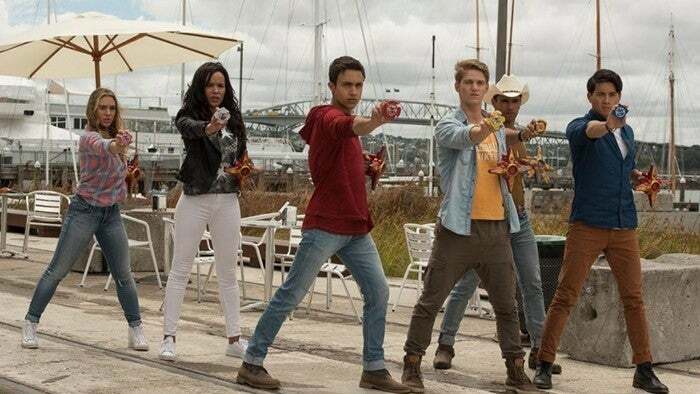 Ninja Steel and now Super Ninja Steel have all had rewarding moments, but there was one sequence that seemed to stand out above the rest for the cast. "There's this one time where the crew got to throw food at our faces and it was really fun," Ane said. The rest of the crew agreed, with Peter adding "Oh my gosh, actually that was favorite time too." "It was a big food fight, and then we all pretty much get pelted with food and it was just fun, it was a really fun day," Webber said. William also mentioned moments like the presidential debate and reuniting with his long-lost brother (Webber), which was a pivotal moment for both characters." "I liked the moments where Jordi and I, or Levi and Brody at their whole brother recognition moment on stage," Shewfelt said. "That was nice, we both looked into each other's eyes, and..."
"They kissed but just cut it out," Ane joked. "Yeah that was off camera," Shewfelt said. "That was a totally cool moment, and I think fans enjoyed it." While the Power Rangers have been around for 25 years now, many of those previous seasons and teams didn't have to deal with social media, which brings with it instant feedback, both of the negative and positive variety. Chrysti Ane reveals how she dealt with that during Ninja Steel. "So I actually went on Ranger board and I read some of the comments, and it, it depressed me a little bit, but then I saw other comments that were so great and so positive that I kind of just learned to, to just not...the people that are going to be positive and appreciate, that's what we're doing it for anyways," Ane said. "So I kind of learned to have thick skin when it comes to that, you know?" While some reactions will undoubtedly be negative, William takes that in stride. "The thing with the fans is that it's a blessing that we have fans that feel so strongly about the show," Shewfelt said. "If they were apathetic to it, and they didn't want to say anything about the show, I think that would be a real failure. So it's good that they care so much that they're willing to be vocal, and the other thing about that is most of our fans love the show. Most of them are very excited about it and they support us, and there's always a vocal minority and I think that's just in anything, so the people that tend to complain are usually louder, so there's just a very vocal minority that tend to do that. But we love the fans!" "Just to add on to that too, I think it's so cool that we are in this situation that we're able to interact with the fans so easily, because I think that past Rangers didn't really have that opportunity, and now that we get to it, it's so cool," Sudarso said. "It's a blessing that we get instant feedback from the people that we're making art for." In a world full of superheroes, the Power Rangers have always offered something different, and the cast has a few ideas as to what really makes the Rangers so beloved and iconic. "Ah, diversity man," Webber said. "I think it's really really cool that from the beginning it's been a really ethnically diverse cast, and they've kept it frequent, they've kept it continuous over all the years of Power Rangers and it's quite cool to see all the races come together and support something that they can all be a part of, so probably, I think that's one thing that we dominate in terms of the superhero kind of world, and it's just really cool that we can involve everyone, and I think that's what a lot of fans love as well." "I also like the fact that Power Rangers not only is it diverse, but it's, it pushes such good values of working together as a team and, what's unique about us is I feel like is that we are the entry point for any superheroes for kids," Sudarso said. "The first thing you think about as a kid when you're watching superhero stuff is Power Rangers because it's, for me anyways, the first thing I think about is that cause it's, that was the first superhero team that I was ever exposed to at a young age." There's plenty to love about the Power Rangers franchise, especially the way it gives a lighthearted spin on things. That includes Levi's Morpher that is shaped and designed after a hamburger, which has become a favorite element of his character. With that in mind, what would the rest of the team's custom Morphers look like? Granted, it's going to be hard to beat my Publix Chicken Morpher (whatever, their chicken is legit), but they had some pretty great ideas. "Preston would probably have some sort of magic wand type deal," Sudarso said. When Chrysti asked what Peter would use in real life though, he had a different take. "I would love like a paint brush. That would be cool." Now, Jordi's character Levi already has the Burger Morpher, but for his personal one, he has some loftier ambitions. "I was just telling Peter, I came up with a cool idea," Webber said. "I'd love a chest plate kind of one, where we hit the Morpher to your chest and twist it and then pound it. Like Iron Man's reactor." That's hard to top, but William managed to. "I would want like, I would love a war hammer type Morpher," Shewfelt said. "I just think it would be really cool to wield that, and then, yeaaaaah, that would be cool." Inspired by Levi, Nico's might just be the most interesting Morpher of all. "Following in those footsteps of Levi Weston, I'd probably go with a nice latte," Greetham said. If Calvin gets a Latte Morpher later this year, you now know where it came from. You can catch the whole cast when Power Rangers Super Ninja Steel returns to Nickelodeon later this year.